Economic dogma asserts that free trade improves everyone’s wellbeing. For decades, both major American political parties have hailed free trade with other countries as critical to voters’ well being. But candidates in the 2016 presidential election have raised piercing questions about the benefits, with both major party nominees distancing themselves from the proposed Trans-Pacific Partnership (TPP), a pact with bilateral support that was seven years in the making. The Republican nominee is even proposing to tear up the North American Free Trade Agreement (NAFTA), a signature policy of the George H.W. Bush and Bill Clinton administrations. Rapidly increasing trade with China, economists now understand, is having a larger impact on American jobs than they had previously realized — certainly far more than NAFTA ever had. The facts and figures of trade can be thorny. Little is straightforward and data can be used to say many things. Think tanks sometimes take aggressive positions. But a close look at the work of leading economists can add context and depth to any journalist’s coverage of free trade. America produces a lot of things, such as Chevrolet Impalas and Boeing 747s. Germany also builds cars and many other products. Right now, Americans pay import tariffs on Volkswagens that are made in Germany. Those taxes protect Chevrolet and workers at Chevrolet’s American plants by making Volkswagens more expensive. If America entered a free trade agreement with Germany, it would have to abolish the tariffs, making Volkswagens cheaper for U.S. consumers and challenging Chevrolet’s market share. But, the theory goes, Americans who lose their jobs building Chevys would change jobs and build something that Germany demands — perhaps jets or gas turbines. Any job losses, proponents of free trade argue, are temporary. Workers in industries exposed to imports can move or train for another job, they say. And in the end, the redistribution will make the global economy more efficient, lifting millions out of poverty, including Americans who will all enjoy lower costs of living thanks to a plethora of cheaper imports — not just Volkswagens but German cheese and wallpaper, too. The argument is, in essence, that everyone benefits. But three events in recent decades have challenged this accepted wisdom. After the United States joined NAFTA — which created a free trade zone with Canada and Mexico — many manufacturing jobs moved to Mexico; labor is cheaper there. Moreover, improved technologies have resulted in the automation of many jobs and less need for laboring hands. (Similar to how self-driving lorries may put truck drivers out of work.) 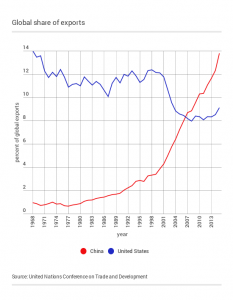 And most of all, China’s rapid rise as a manufacturing power with seemingly limitless cheap labor has dramatically undercut American workers. To these threats, some economists argue, America’s workforce adapted slower than expected and the anticipated benefits for workers have been slow to materialize. As China grew to become the world’s dominant export power, the U.S. lost over 2 million manufacturing jobs between 1999-2011, estimate Daron Acemoglu of Massachusetts Institute of Technology (MIT) and colleagues in The Journal of Labor Economics (2016). Much of China’s advantage in the U.S. has been due to “import competition” — when another country is able to produce and sell you goods your country used to make, but for cheaper. Citing similar numbers, David H. Autor of MIT and colleagues argue in a 2013 paper for American Economic Review that Chinese import competition explains 44 percent of the loss of U.S. manufacturing jobs between 1990 and 2007; from 2000 to 2007 it explains 55 percent of the loss. New American jobs were created during those years, but at a slightly slower pace, says Autor. Another factor costing American jobs since 2001 has been outsourcing — when American companies build factories abroad to take advantage of the cheaper labor. Globalization and the automation of manufacturing processes would have cost American jobs anyways, but with China as a competitor, U.S. manufacturing workers were hit more quickly. Moreover, the production chain has been dispersed as globalized supply chains have grown common alongside improvements in global shipping and communications. The losses sound staggering, but are partially offset by cheap Chinese imports, which help American companies become more efficient and hire new workers. Across the entire economy, import competition actually reduced the U.S. unemployment rate very slightly, argue Lorenzo Coliendo of Yale University and colleagues in a 2015 working paper for the National Bureau of Economic Research (NBER). Because cheaper goods are available as inputs for the service sector (such as the non-flammable insulation materials required in construction), the number of these non-manufacturing jobs grew. And so there is not much America can do about import competition: Retaliatory tariffs — hiking taxes on imports of Chinese imports — hurt both sides. As we’ve seen, American manufacturers have grown to depend on the cheap imports. Moreover, China would likely respond with tariffs in kind, meaning fewer Chinese would buy American products. Tariffs, moreover, gut workers’ purchasing power as the cost of imports rise — the poorest get hurt the most. In their NBER paper, Coliendo and colleagues find that in the short run — considering both the competition and availability of cheap imports — the overall U.S. “welfare” has improved by 0.2 percent; in the longer-run, he sees the trade with China increasing U.S. welfare by 6.7 percent. And while the economic pain is not distributed evenly, even in the short run every state is ahead, he reports. Impact varies across regions — California lost the most manufacturing jobs (computers and electronics, furniture, metals and textiles), but was able to create more jobs than it lost. Writing in The Review of Economics and Statistics in 2016, Shushanik Hakobyan of Fordham University and John McLaren of the University of Virginia examine census data by region and industry to pinpoint vulnerability to competition from Mexican workers after NAFTA came into force in 1994. Controlling for competition from China, Hakobyan and McLaren find that for a minority of American workers who have seen jobs move to Mexico, NAFTA has been traumatic. In areas where industries have been worst hit, a high school dropout saw his or her wages grow 17 percent slower than in the rest of the country between 1990 and 2000. Hakobyan and McLaren also find a trickle-down effect on service workers. For example, a waiter in a diner near a closed factory is also hurt by NAFTA because more people in the area are looking for low-skill work. The waiter is unlikely to get a raise; someone else can replace him or her. One factor in how badly regions were impacted is how quickly tariffs were rolled back for each industry after NAFTA came into effect, Hakobyan and McLaren explain. Each industrial sector enjoyed a different schedule of tariff liberalization (the ending of their protection). Yet overall, they point to research that finds NAFTA has had a small positive effect on American workers. which the World Bank concludes would make the U.S. economy as a whole very slightly better off. The balance of trade is the net flow of goods between two countries. 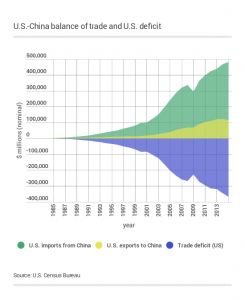 The U.S. has a gaping trade deficit with China. Put another way, China is not buying the same amount of stuff from America as they’re selling it. In 2015, according to the U.S. Census Bureau, the United States imported $483 billion worth of Chinese goods, but sold China only $116 billion worth. The difference, $367 billion, is the trade deficit. The gap hurts the U.S. labor market because American workers cannot balance their losses by selling to the giant market that is their competitor. U.S. industries have “faced a major increase in import competition from China without an offsetting increase in demand for U.S. exports,” write Autor and colleagues in a 2013 paper for the American Economic Review. Analyzing the effect of imports on jobs rather than industry, Abigail Cooke of the University at Buffalo and colleagues find that the use of a globalized workforce for what they call low-skilled repetitive tasks, such as stamping a plastic toy on an assembly line, is pushing down the wages of low-skilled workers in the United States. As these tasks are being sent offshore, Cooke perceives a polarizing effect: High-wage American workers possibly earn even more when low-wage import competition is higher. As the cost of manufacturing basic goods falls (because those goods are now being made offshore or because the offshore threat is pushing low-wage American workers’ wages down), the high-wage earners can focus more on higher-productivity tasks. A 2015 paper by Avraham Ebenstein and colleagues looks at how offshoring and import competition affect American workers’ wages. They find that offshoring — when companies set up factories abroad to take advantage of cheaper labor — has a far smaller impact on American workers’ wages than imports. When jobs are sent abroad, they reduce American workers’ bargaining leverage, putting downward pressure on their wages. But hurting these workers more is the flood of inexpensive (and thus competitive) goods made abroad. When imports rise by 1 percent, American workers’ wages fall by 0.6 percent; a 1 percent increase in offshoring activity is associated with a 0.02 percent decline in American wages, Ebenstein reports. Ebenstein also finds that these people’s wages are hurt by America’s overall shift from manufacturing employment to services industries — and he suspects many workers who lose manufacturing jobs give up looking and leave the workforce altogether. He stresses, however, that a much larger factor in declining wages and jobs in manufacturing has been the computerization of the process: workers are being replaced by machines. That would have likely happened with or without competition from China and Mexico. In a 2016 paper, Autor and colleagues find that free trade is contributing to political and ethnic polarization in the U.S. Starting in the early 2000s, voters in regions facing increasing import competition (that is, areas where factories are closing) began voting out moderates in elections. As these regions grew more liberal or conservative, a telling sign was the ethnic majority: In largely non-white areas, voters were more likely to choose a liberal Democrat. In white areas, voters were more likely to select a conservative Republican. The common source of economic decline also translates into cross-party discontent with free trade. In March 2016, a Bloomberg poll found that 44 percent of Americans believed NAFTA had been bad for the U.S., while 29 percent said the treaty had had a positive effect on the American economy (27 percent had no opinion). The poll showed general cross-party unity, with roughly half of members of each major political party saying NAFTA had been bad for the economy. Bloomberg also found that the vast majority of Americans (82 percent) would be willing to pay slightly more for goods made in the United States. 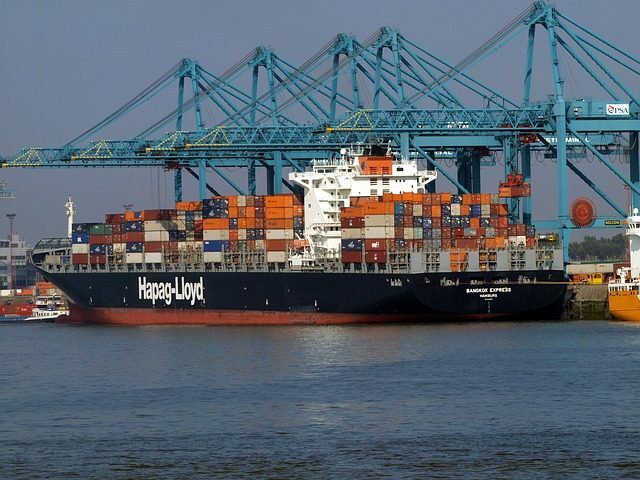 On foreign trade more generally, in March 2015, a Gallup poll reported, 58 percent of Americans viewed trade as an opportunity for economic growth and 33 percent as a threat to the economy. Looking at data back to 1993, Gallup also found some correlation between confidence in the economy and positive feelings about foreign trade. Still, the issue of free trade is low on many voters’ agendas: Only 2 percent of Americans ranked “trade policy” as the “most important” issue facing the nation now, according to Bloomberg. The Office of the United States Trade Representative publishes data on imports and exports with different countries. The U.S. International Trade Commission has a handy tool to calculate tariff rates on imports — the Harmonized Tariff Schedule (HTS). Massachusetts Institute of Technology has a useful visualization tool for international trade data, organized by country and product. Acemoglu, Daron; et al. “Import Competition and the Great US Employment Sag of the 2000s.” Journal of Labor Economics, 2016. doi: 10.3386. Autor, David H.; David Dorn; Gordon H. Hanson. “The China Syndrome: Local Labor Market Effects of Import Competition in the United States.” American Economic Review, 2013. doi 10.1257. Autor, David H.; Dorn, David; Hanson, Gordon H. “The China Shock: Learning from Labor Market Adjustment to Large Changes in Trade.” NBER Working Paper, 2016. doi: 10.3386. Autor, David H.; Dorn, David; Hanson, Gordon; Majlesi, Kaveh. “Importing Political Polarization? The Electoral Consequences of Rising Trade Exposure.” NBER Working Paper, 2016. Caliendo, Lorenzo; Dvorkin, Maximiliano; Parro, Fernando. “The Impact of Trade on Labor Market Dynamics.” NBER Working Paper, 2015. doi: 10.3386. Cooke, Abigail; Kemney, Thomas; Rigby, David L. “Task Trade and the Wage Effects of Import Competition.” U.S. Census Bureau Center for Economic Studies, 2016. Ebenstein, Avraham; Harrison, Ann; McMillian, Margaret. “Why Are American Workers Getting Poorer? China, Trade and Offshoring.” NBER Working Paper, 2015. doi: 10.3386. Hakobyan, Shushanik; McLaren, John. “Looking for Local Labor Market Effects of NAFTA.” The Review of Economics and Statistics, 2016. doi: 10.1162.